CLEVELAND (CNS) — Pope Francis has accepted the resignation of Bishop Richard G. Lennon of Cleveland. 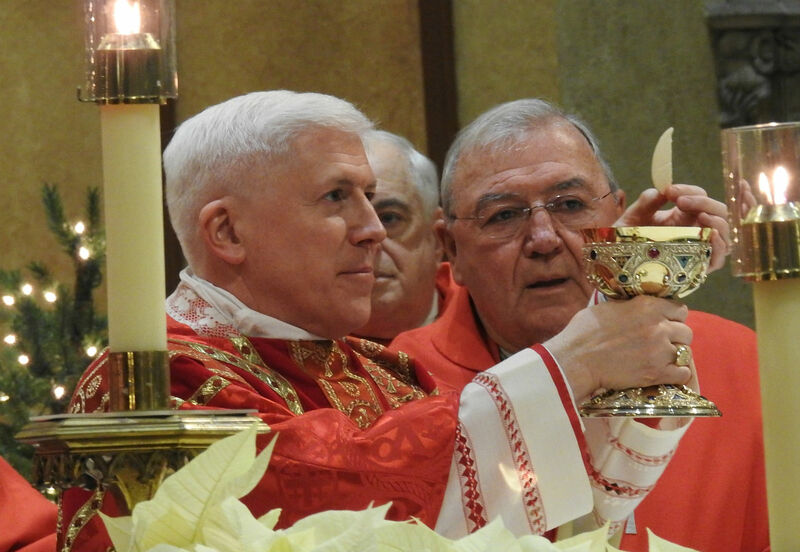 He has headed the diocese since 2006. Bishop Lennon, who turns 70 in March, said during a news conference at diocesan offices Dec. 28 that he had developed vascular dementia, leading to his decision to submit his resignation for health reasons to the pope in November. “Recently it has come to my awareness that my health has declined to such an extent that I should resign as diocesan bishop,” he said. Normally, bishops do not turn in their resignation to the pope until they turn 75, as required by canon law. The pope named Bishop Daniel E. Thomas of Toledo, Ohio, as the apostolic administrator of the diocese until the installation of a new bishop. The changes were first announced in Washington early Dec. 28 by Archbishop Christophe Pierre, apostolic nuncio to the United States. Having to take on the additional responsibilities of overseeing the Cleveland Diocese was unexpected, Bishop Thomas said. He compared his appointment as apostolic administrator to that of an interim coach. “My job is to be the conduit from the past to the future,” he said. Bishop Thomas admitted during the news conference that he had “limited” knowledge of the diocese and that he would undertake a quick study of the Catholic Church that serves 692,000 Catholics in eight counties. As apostolic administrator, Bishop Thomas said, he would regularly travel between Toledo and Cleveland, a distance of about 120 miles. “My sister-in-law texted me this morning and said, ‘Well, maybe they should clone you even though the church doesn’t believe in that,'” Bishop Thomas said, smiling. “Someone else said, ‘Well, maybe you should follow the example of Padre Pio.’ But I’m not a saint, so I can’t bi-locate yet. “But I hope you know I will do everything in my power to work so well with the good folks here and in the Diocese of Toledo to be able to govern the people entrusted to me by Pope Francis until a successor is named,” he said. Bishop Thomas pointed particularly to the “rich ethnic culture and traditions” represented in northeast Ohio and said he was looking forward to meeting parishioners in the diocese’s 185 parishes as well as the priests, deacons and religious communities that minister to them. “There is much for me to learn, understand and embrace as I strive, with your help, to get down to the work of governance in shepherding the diocese,” Bishop Thomas said. Prior to his appointment to head the Toledo Diocese in 2015, Bishop Thomas was auxiliary bishop of the Archdiocese of Philadelphia beginning in 2006. At the archdiocese, he oversaw the Media Affairs Department, the Office for Clergy, including the Department of Permanent Deacons, and the Vocation Office for the archdiocesan priesthood. He was ordained a priest for the archdiocese in 1985 by Cardinal John J. Krol, a native Clevelander. Bishop Lennon was an auxiliary bishop of Boston before he was named Cleveland’s 10th bishop by Pope Benedict XVI. During his decade in Cleveland, he led the revision of the statutes governing the diocese’s finance, pastoral and presbyteral councils, established norms governing internal audits of parishes and schools, and carried out a plan to consolidate parishes. The diocese also completed a capital campaign in 2016 that raised more than $170 million for parish and diocesan needs. A Boston area native, Bishop Lennon was ordained in 1973 and served in the Boston Archdiocese as a parish priest, fire department chaplain, assistant for canonical affairs and rector of St. John’s Seminary. He was ordained auxiliary bishop for Boston in 2001 and served as apostolic administrator of the archdiocese from December 2002 to July 2003 after Cardinal Bernard F. Law resigned as archbishop in the midst of Boston’s crisis over clergy sexual abuse of minors. Cardinal Law’s successor as archbishop, then-Bishop Sean P. O’Malley, was named that July.